Prompt: Let’s have some fun, and go to a Rock Concert!! Whatever rocks your boat. Yeah!! Hunter picked up his guitar cases from the minivan’s floor, and scowled when the snap broke and the case opened. He knelt on the tarmac, and placed the case on the ground, reaching for the lid, he paused, his gaze on the expensive electric guitar resting in the black velvet bed. Hunter touched the surface with reverence. The surface smooth to the touch, he smiled as he remembered the first time he’d fallen in love with the guitar. Fourteen years old, he thought. Listening to a random station in the back of his mother’s house, Bon Jovi’s Have a Nice Day, damn, he loved that song. He’d sang that song every day after that. Screaming it out like a maniac so all the neighbors could hear him. He’d sing in the shower holding the soap like a microphone, at the dinner table with his spoon for a microphone. He’d sang that song until his mother had started calling him, ‘Have a Nice Day’. Of course, he’d grown out of the phase of singing ‘Have a Nice Day’ aloud when no one was happy about it, but not his love for guitars. At fifteen, he’d cajoled his father into paying for classes at a private music school in Hurlingham. He winced at that memory. His father had used it against him for years…through high school really. Every time he failed exams, his father would threaten to discontinue paying for the classes. As a result, he’d worked like a maniac in school. Studying hard, keeping top grades, all for the love of guitars. Snapping the case closed, Hunter got to his feet and carried the case toward the entrance into the Safaricom Kasarani Stadium. His band was having three shows here, before moving on to Tanzania. “Let me get that for you,” a young man hurried to his side, holding out a hand eager to take the case from him. Hunter shook his head. No way, he loved this baby too much to give it to anyone else. “Maina,” the young man said a smile returning. Maina grinned and hurried away in the maze of corridors. Hunter hoped Maina would know where to find him. Hunter glanced ahead to find his bandmates watching him. His crew, he thought taking in the trio leaning on the wall, surrounded by management staff. Hunter remembered the day he’d met them too. Nairobi University, at a poetry discussion meet, they’d all sat in the back, listening to poems about the world ending. Depressed, they’d skipped out and instead gone to hang out at a local hangout joint and ended up starting a band. There was Jake, the band’s drummer. Jake was an architect by profession. Then there was Troy. Troy had started out doing medicine before he ditched that major and pursued music. Troy wrote the band’s music. Then there was Kate. Kate with her long thick braids, and catty eyes that could chill a man’s blood, she was the band’s bassist. Together, they made up the rock band, Furahi. Hunter held up his guitar and Jake shook his head in amusement. “No one will steal it,” Troy teased with a sigh, crossing his arms, his drumsticks held in his left hand. Troy never let anyone carry those either, Hunter thought in amusement. “Well, that’s good to know,” Hunter said with a smile, there was no ending Troy teasing him. They’d all known each other for ten years. Lived through mistakes, bad decisions, devastating outcomes, and disappointments, Hunter could remember each one with a painful pang in his heart. Furahi was successful today, but it hadn’t always been. Their down days haunted Hunter. As though reading his thoughts, Jake touched his left arm. Jake and Troy chuckled; Hunter just squeezed Kate’s shoulder and nodded to their manager who was beckoning them. The next two hours were exhilarating and nerve wrecking. Prepping a concert started months before, but the last few minutes before that first song, Hunter always felt as though the world was dancing on his shoulders. Taking in a deep breath, he adjusted the black fitted pants and the metallic belt he wore. The band’s hair stylist had his hair cut in a short Mohawk; he sometimes didn’t recognize himself in the mirror. If it was up to him, he’d have a full on Afro like Lenny Kravitz, but apparently that didn’t work for him. Hunter shook his head, rubbing his clean-shaven jaw. Oh well, whatever it took to sell their albums. Chicks dug the whole bad boy thing anyway, so…he sipped the water Maina had brought him. He’d had to give an autograph for that. “If I didn’t have a boyfriend, I’d kiss you,” Kate said coming to stand next to him. She looked hot in leather. “Dump him,” Hunter challenged, wishing she would. Kate grinned and pressed a kiss on his left cheek before she walked away. “Tease,” he called after her. “Time,” the show’s producer called into the dressing room, setting off the butterflies in Hunter’s stomach. He’d performed thousands of shows, for thousands and thousands of people. Still, that moment before a concert always got him. He followed his bandmates backstage, climbing the steps with trepidation. “We got you,” Jake said beside him, right before they stepped out on to the open stage. 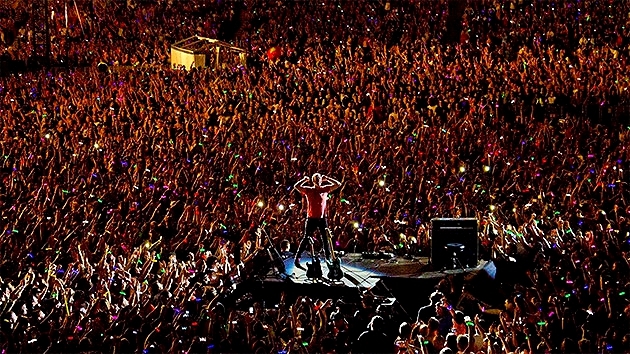 Their audience exploded, screams and shouts, and their energy blew him away. Hunter stood still on the stage, feeling free for the first time in his music career. The audience’s enthusiasm exorcised his butterflies, fueling his energy. Taking his guitar from it’s stand, Hunter walked up to the microphone, amid screams, he was afraid their audience wasn’t going to let him sing. Hunter turned to his bandmates. “Have a nice day….” He sang and got wide grins from them in return, they knew the story of that song. Those days, when he’d sang and, no one had screamed in happiness to hear it. Hunter turned back to the packed stadium, and strummed the first bar of their hit song, ‘Get me home’. Hunter started singing, and as his audience sang along, he finally understood Bon Jovi’s song. Do what you want….no matter what, live your life how you want it. It’s a nice story. Intriguing as always. However, I have an issue with contractions. ‘He’d’ for ‘he had’ which traditionally means ‘he would’. I won’t pontificate about the British and American English, but as a general rule the American one is confusing, especially when the tempo of the story has not been established – it brings about tense mix-up where one has to read twice or the whole sentence to understand or get the time setting. But well, the grammartics will never end.